This is half price In store. It charges and plays music for the Lightning apple product. Works well with our iPad mini/iPhone 5 , 5c and 5s. It charges very quickly and volume of the speaker is ok (not Bose but for £25 can't complain). The iPad and iPhones can be turned also landscape, which is a nice bonus. Please note that description on website is incorrect, this speaker is not bluetooth but just connects via lighting. It plays music and charges at the same time. 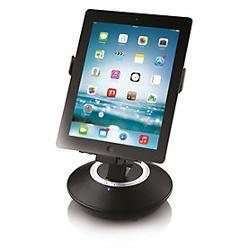 The Red Lightening Speaker Dock is a speaker dock that'll play and charge any iPhone or iPod with the lightning connector. Changing the way you experience music, movies, videos and games on your iPhone or iPad. It also has a 3.5mm audio input jack, so with the right cable you can listen to any device connected.